Logical combinators are one of the oldest form of Turing complete system, going back all the way to Schönfinkel's 1924 paper "On the building blocks of mathematical logic", preceding both Church's lambda calculus and Turing's machine (as well as the older version of such a machine, the Post machine), though their status as such a system wasn't known at the time. Lazy Bird is a small extension of Unlambda, along with the modification that it uses lazy evaluation (i.e. it evaluates the outermost function first when possible), rather than Unlambda's eager evaluation, which evaluates the innermost function first. The "bird" part of the name comes from the fact that the logical combinators used come from the most part from Smullyan's book "To Mock a Mockingbird", where all combinators are associated with birds. The basis of the language is made of logical combinators, which are pure functions, each of one arguments. As such, each function takes another function as an argument, and returns another funtion. These functions are called logical combinators. In terms of lambda calculus, it can be expressed as $\lambda x . x$. $K(x)$ returns the constant function which will return $x$ for all inputs. In terms of lambda calculus, it is the expression $K = \lambda x. (\lambda y.x)$, which evaluated once gives us $\lambda y.x$. As a purely functional language, there should be no side-effects involved, but it would not be particularly easy to use if that were the case. Following Unlambda's convention, the only side-effects will be a class of identity combinators with side-effects, the side effect being the printing of a character. Each of them being of the form .x, which has the same behaviour as i, except for the side effect of printing the character x when evaluated. The only exception is the newline character, represented by the combinator r.
For input, a simple method is to convert user input into Church numerals. For this we will use the combinator _, which when evaluated, will pause the execution of the program and await for keyboard input, which will then be converted into the appropriate Church numeral depending on its ASCII value. Though this may be possible to do in assembly, where both arguments and functions are just integers. It is still possible to write an interpreter of combinators in high-level languages. There are two main ways to do this, first as a string rewriting problem, or as a graph rewriting problem..
First we need to check if the input string is of the correct syntax. There are a few different conventions we can use, but we will mostly deal with three acceptable scenarios. The string is empty, in which case the program leaves immediatly, as there are no combinators to evaluate. The string is a single combinator, meaning either a single letter or one of the printing combinator of the form .x. There's two possible behaviours we can choose here : Either we consider that this operator cannot be evaluated as it has no arguments, or we can consider that a program (program) is really meant to be `(program)i, or some more complex setup (for instance an infinity of identity operators, or some input we decide from the command line). For simplicity I recommend simply notevaluating it. The string starts with an application operator, and is of the form `(valid combinator expression)(valid combinator expression), where the valid combinator expression will be either a single combinator or itself another application of two valid expressions. The program will then try to evaluate the first combinator with the second as its argument. An important function for checking the syntax, and also useful later on, will be to split an expression into its two arguments. This can be done rather simply by counting the number of combinators and the number of application operators encountered in the string. The basic expression of two combinators `CC will have one more combinator than application operator. This pattern repeats itself for any arbitrary expression, as we will construct it recursively by removing one operator and replacing it by one application operator and two combinators, such as ``CCC, `C`CC, ``CC`CC, etc. Once the syntax has been cleared, we can evaluate the expression without fear of troubles. To do this, we go through the string until we encounter a combinator, the behaviour will then depend on the combinator we first encounter. For our purpose, we will only have three main cases : the combinator encountered requires either one, two, or three arguments (in the currying sense), since the string transformation rules that we defined do not have any combinators requiring more than 3 arguments. If we need $n$ arguments for the function, this means that the combinator needs to be preceded by $n$ function application operators, otherwise it cannot be evaluated. In this case, we will proceed onward in the string until we find another combinator. There is a fairly straightforward conversion of combinators into lambda calculus, as the table of combinators imply, but the other way around is a bit more complex. 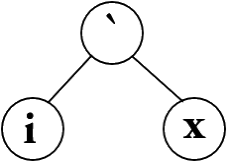 This is done through a process called abstraction elimination, by which any lambda expression without free variables can be converted to a logical combinator. This means that applying this list to a function will apply the function to all elements of the list.